Click the image to see the hi-res PDF schematic. The international 240V schematic can be seen here. Click here to download the DIYLC file. 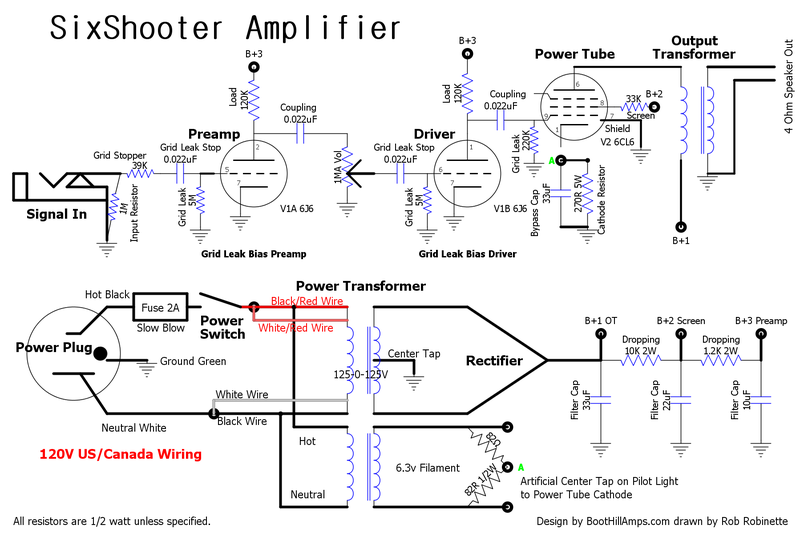 Notice how the SixShooter's preamp and driver circuit use grid leak bias. Their cathodes are connected directly to ground with no cathode resistor. A tube's bias voltage is the voltage difference between the grid and cathode. 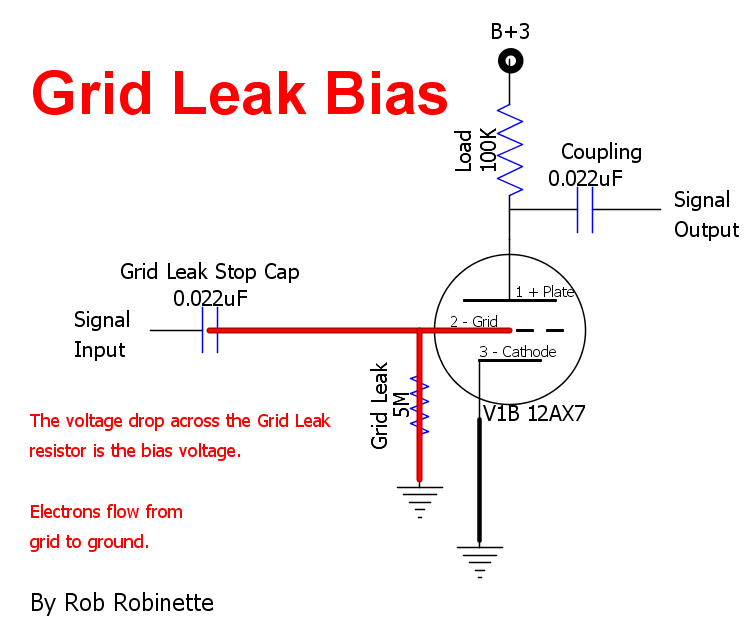 Grid leak bias gets its bias voltage from grid current. Grid current is caused by space charge electrons hitting the grid. The negatively charged electrons give the grid a negative voltage. An input "grid leak stop" capacitor is required to keep the electrons captured by the grid from leaking out through the 39k grid stopper and 1M input resistor. The grid current is forced to flow through a large 5 mega ohm grid leak resistor which causes a voltage drop with negative voltage on the grid that functions as the bias voltage. The grid leak stop capacitor actually performs three functions: As previously mentioned it ensures grid current flows through the 5M grid leak resistor, it acts as a grid current reservoir to stabilize bias voltage and as a high-pass filter to remove unneeded bass frequencies. One thing to consider with this amp is that large input signals from hot guitar pickups or gain pedals can overwhelm the grid leak bias circuit and cause massive shifts in bias voltage and tube operating point. A hot signal can put the grid into positive voltage which will greatly increase grid electron flow and therefore quickly shift the tube bias toward cutoff. The increase in grid current charges the grid leak capacitor which adds a time-varying behavior to the circuit. If you push the amp just right so the grid bias shifts just the right amount during play you can get a very musical distortion from the preamp stage but push it too much and the excess bias shift can cause things to go south quickly. Another trait of grid leak biased preamps is they tend to be very sensitive to tube variations so tube swapping even among the same tube brand can lead to very noticeable tone change. 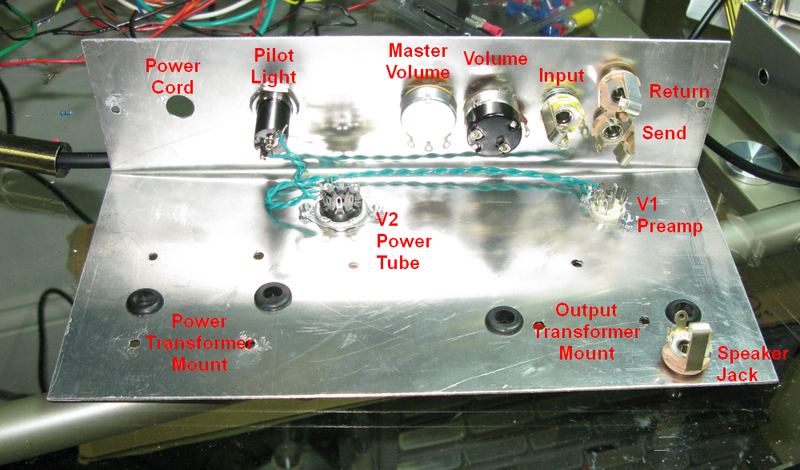 The Fender 5A3, 5B3 and 5C3 Deluxe amps used grid leak bias for their first stage preamp. Click the image to see the hi-res PDF layout. The international 240V layout can be seen here. Click here to download the DIYLC file. Master Volume, Pentode/Triode switch and Speaker Jack mods. The FX Loop jacks aren't shown on the schematic but they go between the Volume pot mid terminal and coupling cap. Click here to download the DIYLC file. Master Volume at top center, FX Loop at top right, Pentode/Triode switch at center, Speaker Jack at bottom right. I turned the Volume and Master Volume pots 180 degrees to shorten leads and keep the Volum pot's power wires away from the signal leads. No ground wires are shown on the jacks because they are grounded directly to the chassis. Click here to download a hires PDF Layout or the DIYLC file. The only modifications I have made so far to my SixShooter are the addition of a Master Volume, simple FX Loop, Pentode/Triode half power switch and a speaker jack. The Master Volume simply replaces the power tube's 220k grid leak resistor with a 250KA (audio or log) pot. The Master Volume also functions as the FX Loop Return level control. An added benefit of the Master Volume is it can add a grid stopper resistance which reduces power tube blocking distortion. By turning the Master Volume down from 10 (max) to 9 you add about 40k of grid stopper resistance between the grid and coupling cap which is enough to slow the charging time of the coupling cap and reduce or eliminate power tube blocking distortion. The 220k power tube grid leak resistor must be removed from the circuit board (just to the right of the 10uF filter capacitor). The FX Loop is very easy to install and adds a lot of flexibility to the amp. Connecting high output effects like boost, reverb and delay to the FX loop keeps the preamp from being overwhelmed by bypassing the first gain stage. I just rerouted the wire that ran from the volume pot output (center wiper terminal) to the .022uF coupling cap through two 1/4" jacks. The signal flows from the Volume pot wiper to the Send jack's Tip terminal, then to the Return jack's Switch terminal, through the switch to the jack's Tip terminal and on to the coupling cap on the circuit board. The Send jack is a Switchcraft 11 two terminal and the Return jack is a Switchcraft 12A three terminal switched jack. With nothing plugged in the signal flows through the two jacks unmolested. The Volume control functions as the Send level control and the optional Master Volume functions as the Return level control. The FX Loop functions as a standard effects loop but the Send jack can be used as a "preamp out" to send the output of the preamp and volume circuit to an external poweramp or processor. The Volume control sets the Send level. The FX Loop Return jack can be used to feed a signal directly into the driver and power amp, bypassing the amp's first stage preamp and volume circuits. If you build your SixShooter without a Master Volume any signal injected at the Return jack will be amplified at maximum volume by the SixShooter's driver stage and power amp so the volume must be controlled by the audio source's volume control. You can plug your guitar into the FX Return jack (remember to turn the guitar's volume down first) to bypass the preamp and volume circuit for a very clean, high headroom, even lower output amplifier. The Pentode/Triode Half Power switch allows normal, high power pentode mode with the power tube screen powered by B+2, or half-power Triode mode with the screen tied to the tube plate which effectively eliminates the screen turning the tube into a triode with a suppressor screen. The switch is an ON/ON SPDT mini-switch. I placed the switch on the front panel but putting it next to the tube would make for shorter wire runs. The switch is wired so that when the toggle is down you get normal high power Pentode mode and up for half-power Triode mode. The Triode mode overdrive tone is very different than the Pentode mode so it opens up the amps tonal pallet a little. 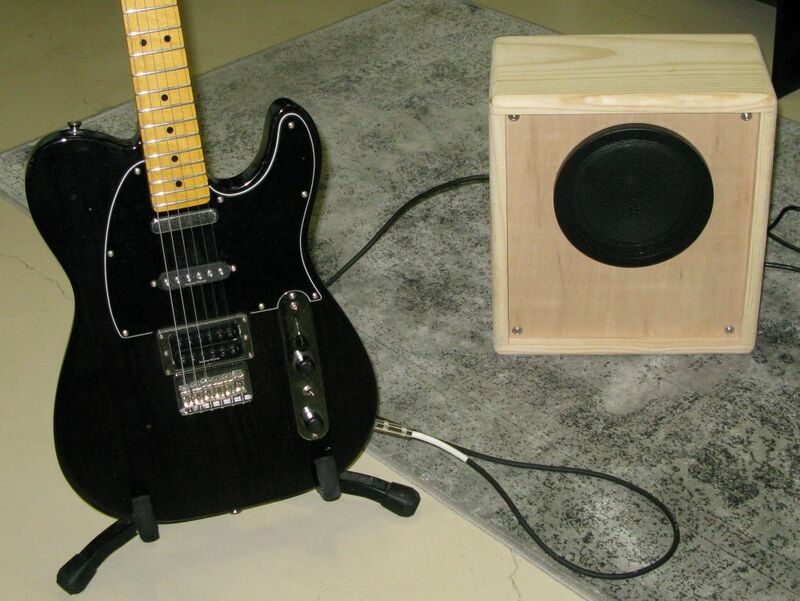 The Speaker Jack makes it easy to play my SixShooter through external speaker cabs. 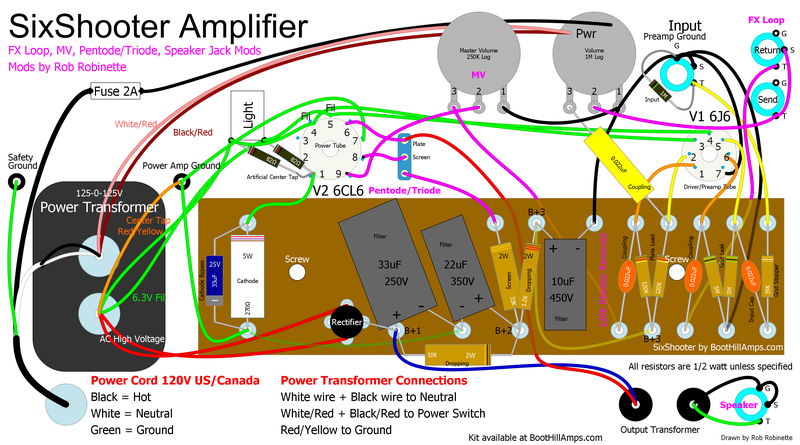 The jack is set up as a Switchcraft 12A switched jack to protect the output transformer in case the amp is powered up with no speaker plugged in. You must add a jumper to connect the jack's ground and switch terminals. 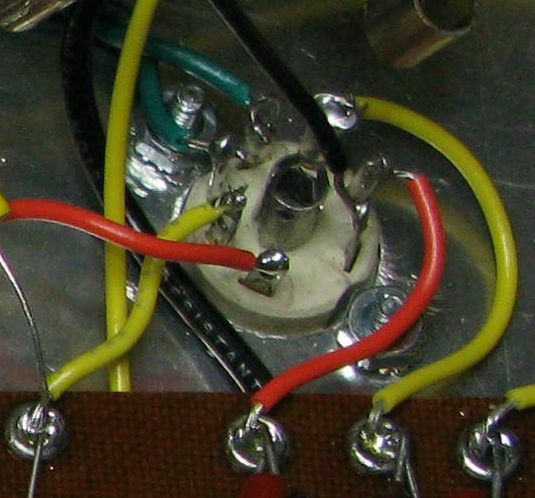 A 1/4 inch male TS (Tip Sleeve mono) plug must be installed on the speaker's wire to connect the internal speaker to the amp. Connect the speaker's positive wire to the plug's tip and the negative wire to the plug's sleeve. 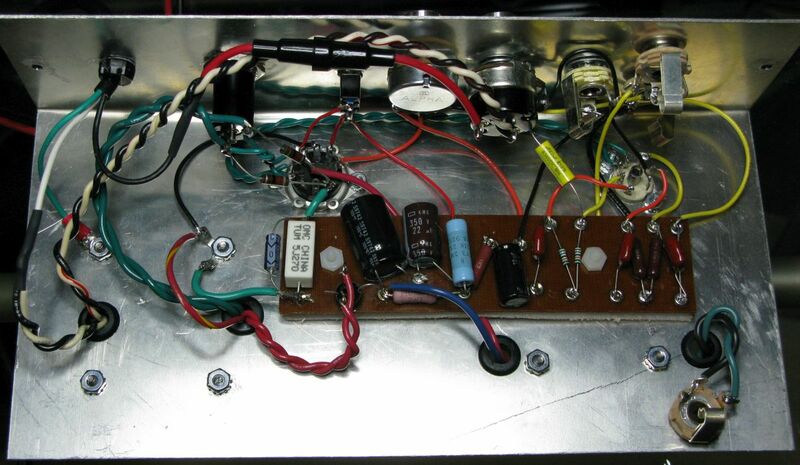 Tube amplifiers use lethal high voltages and have large capacitors that store enough electricity to kill. You MUST verify no voltage remains in the caps before working on an amp. Verify there is no voltage present by testing the large caps with a multi-meter in the DC volts mode. Put the meter's two probes on both leads of each cap and verify no voltage is read. Also keep in mind the tubes can be very hot. Start with the circuit board. I like to measure and record the resistance value for all the resistors as I put them on the circuit board. Knowing the exact resistance value can come in handy when measuring bias and troubleshooting and it can keep you from putting a 470 ohm resistor where a 470K is called for. Install the rest of the components to populate the board but don't start soldering until they are all in place and you're sure they are placed correctly. Make sure the negative terminals of the big electrolytic filter capacitors are connected to ground because they may explode and damage the output transformer if installed backwards. Install tube, jack and control wires to the circuit board and leave a couple inches of extra wire so you can trim to fit later. For wire color I like to use yellow for the signal path, red for power, black for ground and cathodes and green for heaters. This is a good time to post a pic of the board (front and back) on a guitar forum for others to review. I like the TDPRI Shock Brothers DIY Amps forum (I'm robrob). Be sure and keep a photo of the back side of the board so you can review it in case you have to troubleshoot the amp at startup--you don't want to have to remove the circuit board to verify its backside wiring and solder joints. It's a good idea to use a heat sink clamp on component leads--especially capacitor leads--to protect the component during soldering. Even just an alligator clip on the component lead between the soldering iron and component body will protect it from over heating. Pay close attention to the polarity of the three big electrolytic capacitors. I forgot to drill the hole for the Pentode/Triode switch between the Pilot Light and Master Volume. Mount the tube sockets, pots, pilot light and transformers in the chassis and do as much wiring on these as you can before you mount the circuit board because it will get crowded in the chassis. Don't forget to do the heater wires first, before you install the circuit board and begin hooking up the other tube leads. Try to keep the tightly twisted heater wires down against the chassis floor to reduce noise and hum. 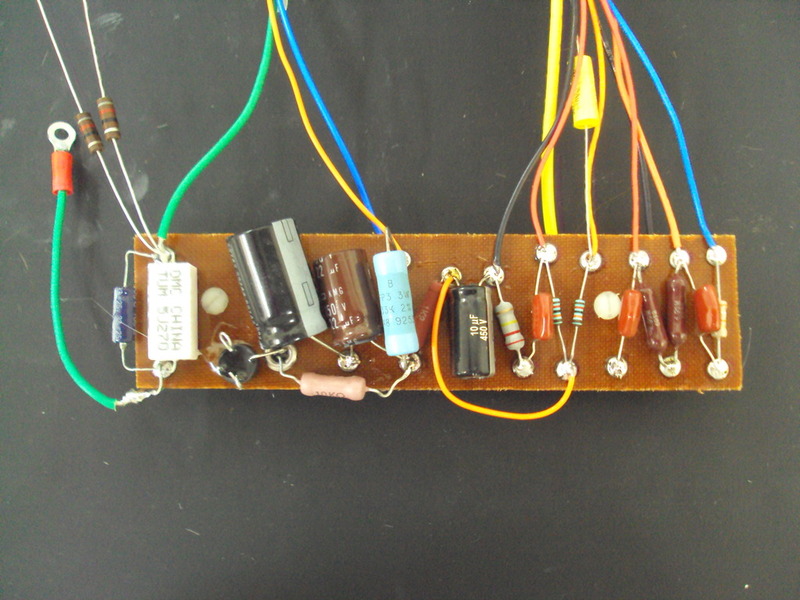 Keep some distance between the big, hot cathode resistor and bypass cap (far left). The two resistors from the pilot light to the power tube cathode pin form a 6.3v artificial center tap. Connecting it to the cathode elevates the heater ground reference to reduce 60Hz hum. The Pentode/Triode switch has been installed between the Pilot Light and Master Volume. The power cord's black hot wire connects to an inline fuse and on to the power switch located on the back of the Volume pot. 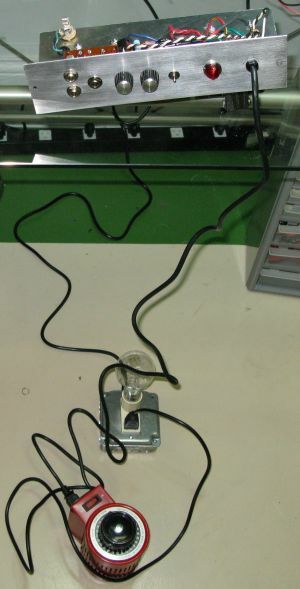 The cord's white wire is connected to the white and the black power transformer primary wires. The cord's green safety ground wire is bolted directly to the chassis using a power transformer bolt. The power transformer's black/red and white/red wires are connected to the other power switch terminal. The red/yellow center tap is connected to ground using a power transformer bolt. 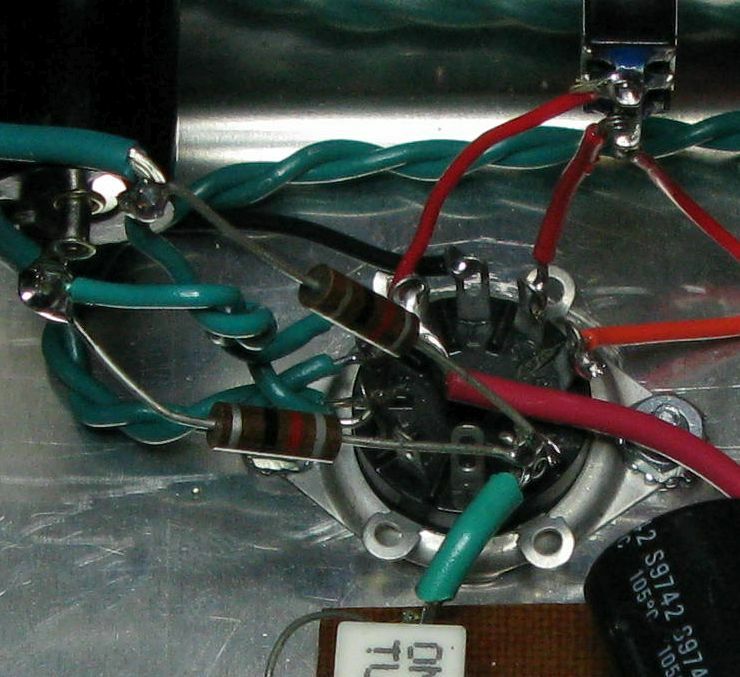 The two red high voltage wires are connected to the solid state rectifier. The two 6.3v green tube heater wires are connected to the pilot light. I used the variac to slowly bring up the voltage on the new filter capacitors. The light bulb limiter helps protect the amp from short circuits and other wiring errors. I powered it up with no tubes installed and checked proper AC voltages out of the power transformer and DC out of the rectifier and on the tube plate pins. I then inserted the tubes and repeated the voltage measurements. 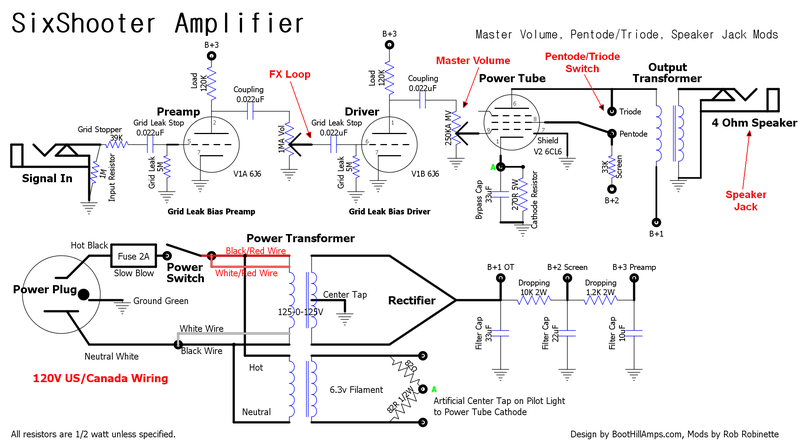 I highly recommend you follow my Amp Startup Procedure when adding power to your newly built amp for the first time. Following his procedure will minimize damage from a build error. Before applying power I measured each resistor with a multi-meter and compared it to the layout diagram to make sure I didn't mix any of them up. I then followed the Tube Amp Startup guidance. Always unplug your amp before working on it because the fuse and power switch terminals are always hot. 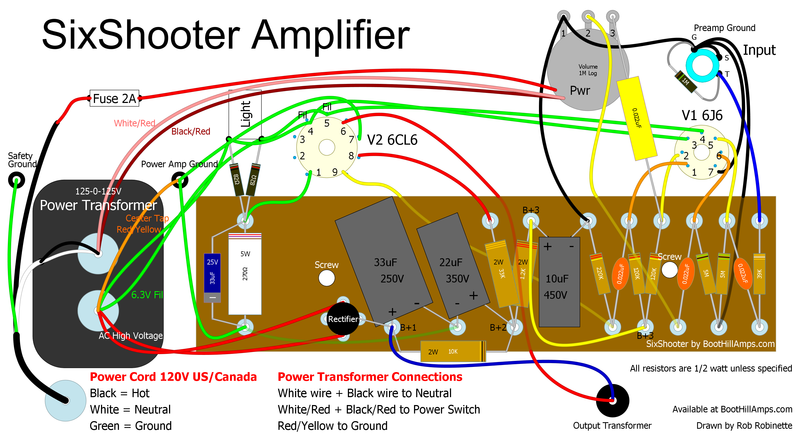 Also keep in mind the amp's big filter capacitors will hold their full charge when no power or preamp tubes are installed. With 165.4v between the plate and cathode and with a 2.6v drop across the 270 ohm cathode resistor the power tube is biased at 1.5 watts of plate dissipation which is 20% of the rated max dissipation of 7.5 watts. 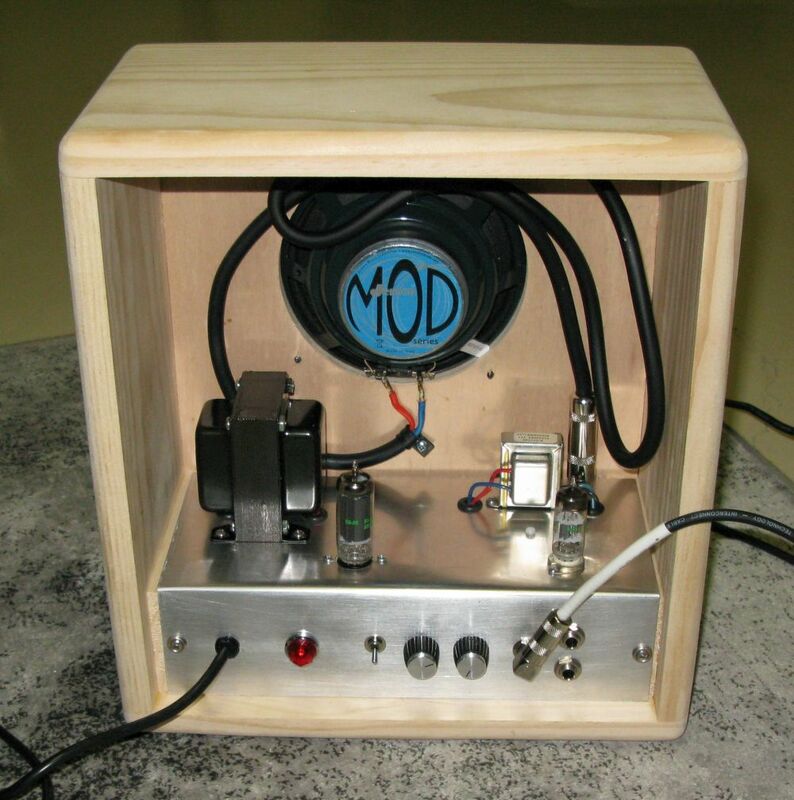 The speaker that comes in the kit is a Jensen MOD 6 12 (6 inch 12 watts). It sounds pretty good for a 6 inch speaker. The mini switch is the Pentode/Triode switch (half-power switch), left knob is the Master Volume, right knob is the Volume and the two jacks on the right are the Send and Return FX loop.